Over the last several decade years, great successes have been achieved in the industrialization of organic light-emitting diode (OLED) technologies. Active-matrix OLED (AMOLED) emerged as an important and low-cost candidate to replace liquid crystal displays due to its attractive advantages like self-emitting, high efficiency, high contrast, vivid color, fast response, and flexible form factor. The purpose of this eBook is to present an introduction to the subject of AMOLED and their related technologies which are generally integrated to the production application, including OLED basic working principles, fabrication and characterization, white OLED technologies, light outcoupling technologies, encapsulation technologies, thin film transistor backplane technologies, driving scheme, circuit and layout design technologies. Although it is impossible to cover completely the vast amount of publications concerning these topics, we will select those key areas in device structures, fabrication techniques and application that we feel are most pertinent to the practical production. This book will be helpful for young scientists and engineers who work at the development of practical OLED display and OLED lighting. Target readers include researchers in organic electronics field, undergraduate and graduate students who study in OLED display and OLED lighting, and also for the engineers who work in OLED industry. 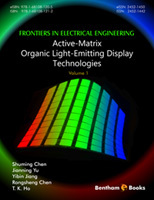 Through reading the eBook, readers can get a comprehensive and insight view of the AMOLED display, including the principles of OLED, the fabrication and characterization techniques of OLED and various related technologies for display system integration, which is benefit for their future academic or industrial career. The author(s) confirm that this chapter contents have no conflict of interest.